A few weeks ago, Ian and I visited the Secret Bunker. Hidden beneath a farmhouse in the Fife countryside, until the Cold War ended this concrete complex of underground rooms was all that stood between Scotland and nuclear meltdown (okay, I exaggerate, but you get the picture). Our visit left me feeling slightly disquieted, as if for half my life I'd been standing on the precipice of Armageddon and never even known about it. 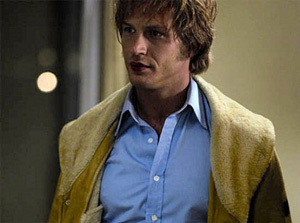 Tinker Tailor Soldier Spy left me with the same uncomfortable feeling. Like the Secret Bunker, it's a perfectly preserved period piece, washed in dreary nicotine-stained browns and yellows, revealing a shadowy world of subterfuge and pretence, glimpsed hazily through a fug of cigarette smoke. And, also like the Secret Bunker, it's not something you'll forget in a hurry. 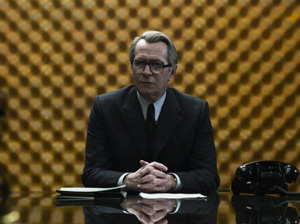 George Smiley (wonderful wonderful Gary Oldman) is retired from the Secret Service when a disastrous mission to Hungary ends with an agent shot, captured and tortured with horrible wallpaper by the KGB. But when a younger agent, loose cannon Ricki Tarr (the ubiquitous Tom Hardy, superb as ever) contacts 'the Circus' to reveal that there's a mole in its upper echelons, Smiley is re-recruited to smoke him out. I won't beat about the bush, everything about this film is fantastic. A gripping plot that twists and turns but never loses its focus is brought to life by the crème de la crème of British talent. John Hurt, Colin Firth, Mark Strong, Benedict Cumberbatch, Ciarán Hinds, Tom Hardy: any of these actors can carry a film in their own right – to see them all together is an unbelievable treat. But despite this, Tinker Tailor belongs to Gary Oldman. After years reducing scenery to pulp as the bad guy of choice in Hollywood, here all he needs do is blink, clutch a bannister, twitch a cheek, to speak volumes about Smiley and his dried-up, lonely, dedicated life, his razor-sharp mind and muddled emotions.